Potato Chutney or rather “Satini Pomme de Terre” as we call it in Mauritius is another typical vegetarian dish from Mauritius. It is a very simple basic dish and yet one that is very much loved by everyone who may have tried and tasted it. “Satini Pomme de Terre” with lots of fried onion and dried red chillies is simply one that yields comfort in one word. Mum used to make this and any leftovers we would have for our school lunch sandwich filler. I like to eat it with a “bouillon brede” and I eat it my way… I enjoy eating it with my fingers. The food always tastes better and most certainly increases the appetite. 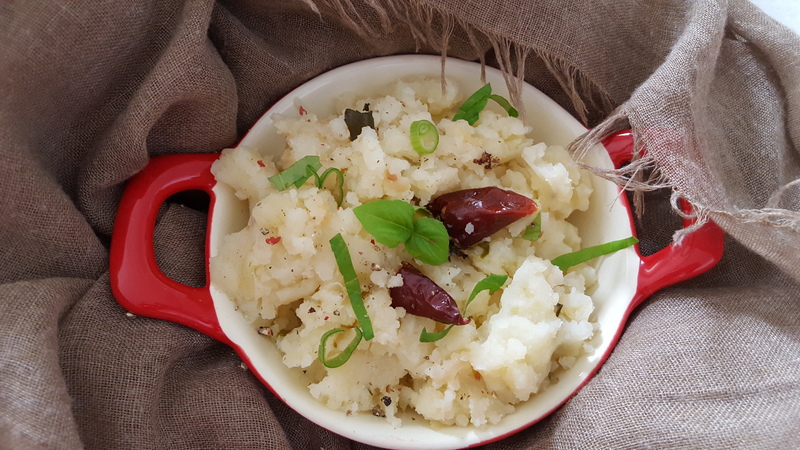 Often this potato chutney is made to accompany other vegetarian dishes such as a “rougaille” which is a creole tomato sauce. 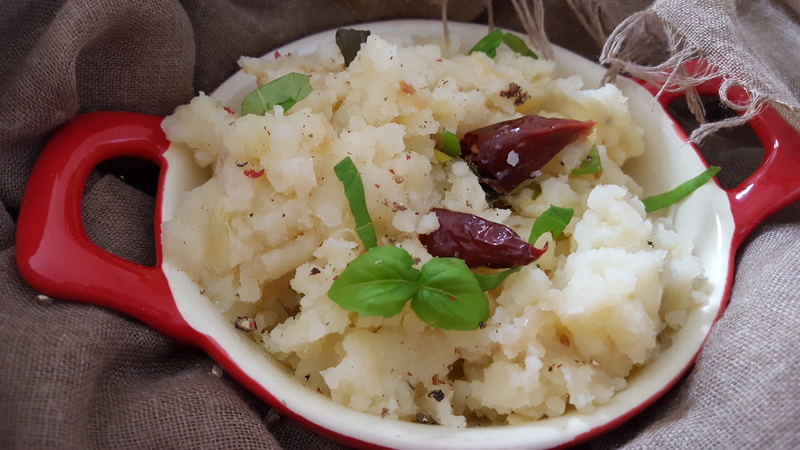 Potato chutney is very easy to make, that needs very little cooking skills, so if you have never tried it this is your chance. 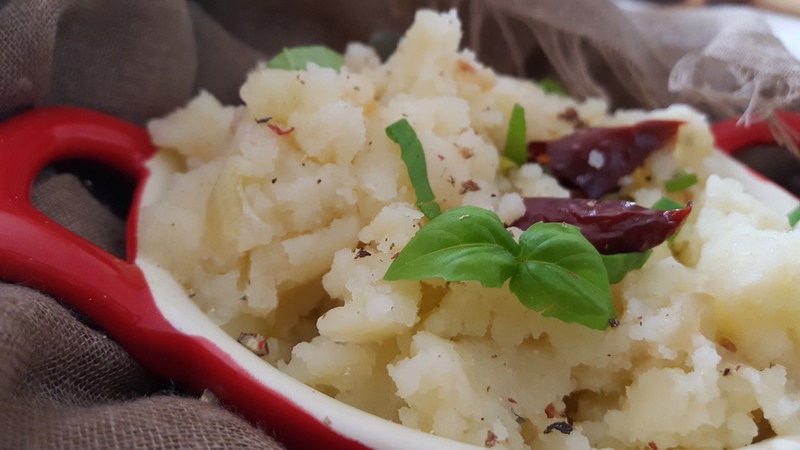 Here you are for all those potato lovers, one very simple recipe – mashed potato with a few spices to spice up your favoured root vegetable. I like this in a bread roll – who says you can’t have starch with starch….. think chips in a roll hmmmmmm heavenly. Peel and cut the potatoes into cubes. This recipe is traditionally made with boiled potato but I steam mine in the microwave for 5-8 minutes until soft, tender and easy to mash. (Steaming potatoes is a good way to keep the flavour). While still warm using a potato masher or fork mash the potato to a smooth texture. In a pan heat the oil add the sliced onion, cook until translucent and golden. Add the cumin, sliced curry leaves and the chilli. Followed by the mashed potato. Season with salt and cook all until all the spices have incorporated. At this point should you wish to add a little water you can, as it will help to bind the flavours together. Drizzle a little olive oil turn the heat off sprinkle with chopped herbs of your choice. Brinda’s Note: This is such a lovely dish to accompany so many other dishes make a perfect vegetarian plate of food.